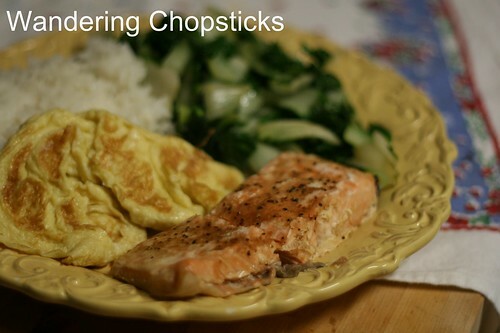 My favorite quickie meal is baked salmon with lemon pepper seasoning, Scrambled Egg Omelet, rice, and Sauteed Bok Choy. There's just something about those combinations of flavors that just makes me happy. I've mentioned the baked salmon with lemon pepper seasoning before when I also baked broccoli and made Kinpira (Japanese Burdock and Carrot Matchsticks). The latter recipe really needs to be redone, but as I make the baked salmon much more often, it's about time the recipe, such as it is, gets newer photos and a separate post. 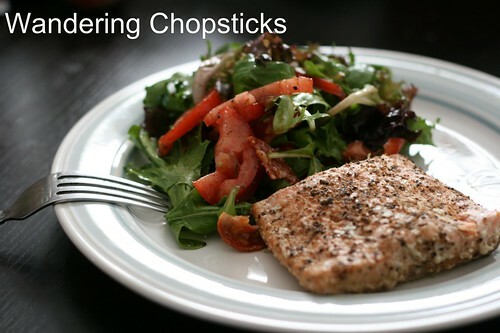 Optional: You can use fresh lemon juice and fresh ground black pepper, I just always have lemon pepper seasoning on hand in the pantry and like the concentrated citric taste. On a sheet of aluminum foil, drizzle some olive oil if you wish. Sprinkle about 1/4 tsp lemon pepper seasoning on a 4 oz fillet of salmon. Add more if you wish. 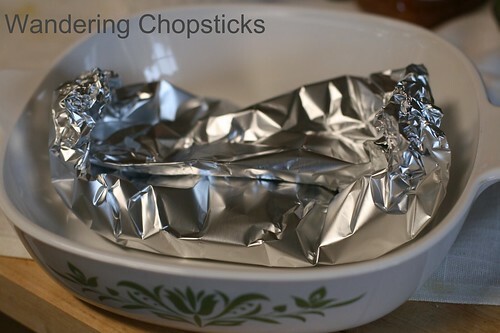 Wrap the salmon up in foil first through one side, and crinkle up the ends so it makes a tight seal like so. Bake in the oven at 350 degrees for about 20 minutes, more if you have a larger piece of fish. The salmon is done when it is no longer translucent. Moist and flakey salmon every time. Serve with a salad or rice, or eggs, or bok choy, or whatever you wish. This recipe is my go-to when I'm tired or lazy. It works best with fresh salmon, but even with Albertson's cheap $1 frozen individual packets of salmon, like what you see in the picture below, it satisfies when I'm hungry and don't want to fuss much with cooking. What are your go-to quickie dinners? 1 year ago today, pinot gris and pinot noir wine tasting at Hawks View Cellars - Sherwood - Oregon. 2 years ago today, introducing baby M3 and baby A's first birthday. 3 years ago today, Chinese Noodle Soup with Ground Turkey and Pickled Mustard Greens. 4 years ago today, Ta Prohm - Cambodia. 5 years ago today, Kinpira (Japanese Sauteed Gobo (Burdock) and Carrot Matchsticks). Wouldn't you know, I got a salmon steak (not my favorite cut, but it was on sale) and couldn't decide what to do. This sounds super simple and delish, too! Next time then. Fillets are much easier, but I've done this with steaks and whole salmon too with no problems. My quickie dinner: omelette, rice and ketchup! Oh and stir fried cabbage with soya sauce. mmmmm. Ketchup! I like my eggs with fish sauce. :) I do boiled cabbage or stir-fried with a bit of oyster sauce. I cut the salmon into small bite sized pieces, and saute them. The salmon is oily enough that it doesn't need additional oil. These are GREAT for potluck parties, because they are easy to eat and really tasty! Great idea! Salmon skewers perhaps?